Stream Gaging Station - What is a Gaging Station? 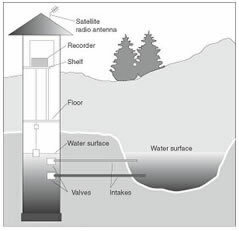 Gaging stations are facilities used by hydrologists to automatically monitor streams, wells, lakes, canals, reservoirs, or other water bodies. Instruments at these stations collect information such as water height, discharge, water chemistry, and water temperature. These stations collect information about the stream and transmit it to the USGS via a satellite communication system. The data is then processed and delivered to the public via the internet. Image by USGS. 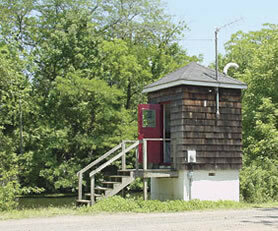 The US Geological Survey has gaging stations at thousands of locations across the United States. Each dot on the map represents one USGS stream gaging station in their real-time stream flow data system. Image by USGS. Enlarge map. Measurements from these stations are useful for a wide variety of flood prediction, water management, recreation, and navigation purposes. USGS realizes the public demand for this information and allows anyone to use it. Check on a stream Gaging Station near your home. Image by USGS. Enlarge graph. There are many different types of stream gages. The photos below will give you some idea of their variety, expense, size, and technical basis. All of these gages measure the stage of the stream (height of the water above a datum). Stage values can be converted into discharge values if a rating curve has been established for the stream at that location. Staff gage in a river. The simplest stream gage. 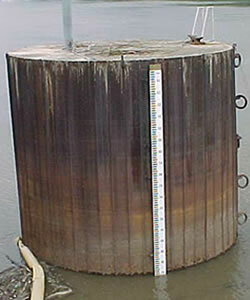 A "giant ruler" mounted on a pier, bridge support, post or column. Stage height is read manually. Staff gage in a stream. Permanently mounted on the side of a bridge, a wire weight gage has a weight, a reel of wire, and a manual crank. The weight is lowered until it touches the water. A calibrated spool accurately determines how much wire was required for the weight to reach the water. This number is used to calculate the stage of the stream. 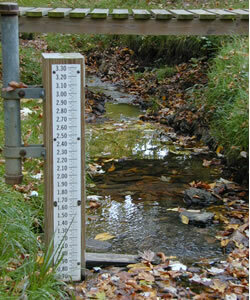 This type of gage is mounted above a pipe that penetrates the bottom of the stream or sediments along the stream's bank. Water flows into the pipe through perforations or through the sediment and fills it to the same level as the water in the stream. Pressure sensors or a float/wire system is used to determine the height of the water. Some of these gages record the height of the water in a memory - which is then downloaded to a laptop during occasional visits by the hydrologist. A permanent house that holds stream gaging equipment - typically a gage of some type, a computer, and a satellite uplink. Frequently a stilling well or a vertical pipe is beneath the gage house. 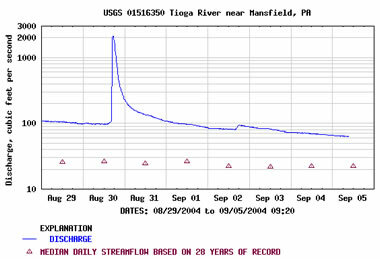 Images on this page are from USGS and NOAA. Photo of a gage house. Diagram of a gage house.